The IBM® System z® platform is the strategic core of business world wide. By using a realistic customer scenario, two IBM teams ventured to demonstrate how to deploy the IBM service-oriented architecture (SOA) portfolio on IBM z/OS® and on z/OS in partnership with additional platforms such as AIX® and Linux® for System z. 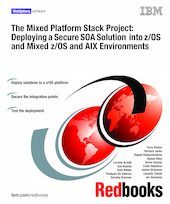 The teams created the experience that is documented in this IBM Redbooks® publication to explain the work that is required to create, deploy, and test the SOA solution on both z/OS and z/OS with additional platforms. The teams also performed extensive testing to verify the correct behavior of the platforms, products, and applications involved. This Redbooks publication covers the product configuration that is necessary to build the SOA solution described in the project scenario. This book provides useful hints and tips that were discovered during the course of testing to ensure successful solution deployment. It also provides an extensive set of references to other documents that proved useful for building the solution. This book is designed for IT professionals who are interested in creating an SOA solution either entirely on z/OS or on z/OS in conjunction with other platforms. Prior to reading this book, you must have basic knowledge of SOA solutions, z/OS or other platforms, and the SOA products running on those platforms.